What a difference a week makes. 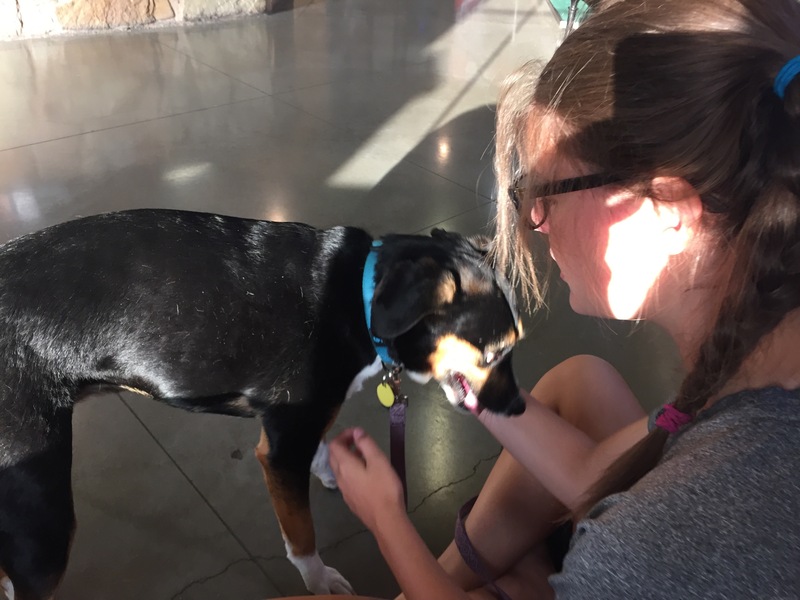 Last Sunday, daughter and I were in emergency pet care with Chloe, our beagle/Australian cattle mix dog who was having severe back problems. So severe that her whole body shook and she winced every time she tried to sit or lie down. It’s not the first time Chloe has had back problems. About this time last year, while we were renting (before our house was ready), she was in her kennel and tipped it over. Within a week, she couldn’t walk upstairs or jump on the couch without wincing in pain and she wasn’t eating. Needless to say, we found a vet for her quickly. The vet examined her and said she probably had a pinched nerve. She was put on the corticosteroid Prednisone, relegated to no stairs or jumping and she fully recovered within a month. We’re not exactly sure what she did this time, but she had been known to take the stairs a wee bit fast, causing her to sometimes stumble a bit. That, combined with jumping on the couch or daughter’s bed, could have done it. This time though, she definitely seemed to be in more pain. When we came home from daughter’s soccer game late Sunday afternoon, she was a quivering mess, her tail between her legs and wincing. We found the nearest emergency pet care center and took her there. The photo below was taken at the center. Her back is slightly hunched and she was panting pretty hard. We felt so bad for her. The doctor prescribed Predisone again and a pain reliever. She also said she might have something called Intervertebral Disc Disease. Intervertebral discs are cushioning pads of fibrocartilage that sit between most of the vertebra of the spinal column. The discs have an outer layer of tough fibrous tissue and a center that is more of a gel-like substance. They act as shock absorbers for the bones called vertebra in the spinal column. The discs can degenerate, bulge, burst or rupture, and when that happens, the material inside escapes into the spinal column, pressing against the spinal cord or nerve roots, which causes pain, nerve damage, and sometimes, paralysis. IVDD is supposed to be one of the most common neurologic disorders seen in pets, especially dogs. An MRI or CT scan can help diagnose this, and treatment can include surgery if medication doesn’t work. Fortunately for Chloe, the Predisone has done wonders. Although she pretty much slept for the first day or so, by day 3, she started to get back to her old self, begging for table scraps and asking to go outside. She was restricted to a leash for the first four days so she couldn’t run, but since then, we’ve just been going outside with her to make sure she’s taking it easy. Steps are out for another week or so to make sure her back is healed. If it happens again, we’ll have to consider more serious treatment, something none of is looking forward to. Chloe has been with us for a long time, and she’s part of the family. It’s hard to see her pain. We’d much rather have her be her goofy self, always wanting to play or go outside. So sorry to hear about your baby. Glad she is feeling better though. We know all to well how hard it can be to see them in pain and to care for them. Our Schatzi was paralyzed for three months and is just recently recovering. Those darn long adorable pups. Aw, I’m so sorry to read that Chloe is in pain. I hope you find a remedy that will bring her back to herself again, not just a temporary fix. No fun when a ‘baby’ is down.